A mage’s Sanctum is his home, and the Hallow is the soul of it. When bereft of these two things, the mage is not only robbed of her sanctuary but also the Mana that replenishes her magic. Wars have been waged among mages for centuries over the right to call a Hallow their own, and bitter enemies have been forged from the fires of dying Sanctums. Now yours is on the line. What will you risk for the right to call a place home? A story in the Storytelling Adventure System for Mage: The Awakening. 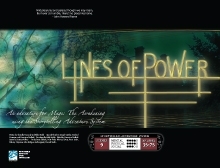 Lines of Power contains a number of interactive links that take you to page references and reference sheets to help you stay organized at the gaming table. This title was added to our catalog on April 02, 2008.